With the exception of our 1987 entry, this series of articles on Mario titles for each year since 1985 has been all about main-series platformers. 1992 was a significant year, then, as it brought the highest profile spin-off based in the Mario universe - this wasn't a silly cameo from Mario, but rather a new kind of game starring the plumber and seven other characters from the IP. This wasn't the first racer on the Super NES, of course, with the iconic F-Zero being a launch title on the system, with that entry also being an early demonstration of Mode 7 effects at work. Prior to the 1992 arrival of Super Mario Kart (early 1993 in Europe), however, the kart racing genre had little relevance in the market. As was typical of Nintendo at the time, it leveraged its IP with some terrific gameplay to establish another smash hit; inevitably it would be copied by rivals in the years that followed, while Mario Kart became one of the big N's most valuable franchises. Anyway, we're somewhat skipping ahead, so let's dial back. As had become the norm for major releases with Mario in the title, Shigeru Miyamoto was prominent in his role as producer for Super Mario Kart, with Tadashi Sugiyama and Hideki Konno directing; Konno-san is now the long-serving series producer, continuing that role with Mario Kart 8. Reportedly, early prototypes were for a generic kart racer with multiplayer as a priority. Yet the creative direction of the project came up against hardware restrictions, while the decision to turn it into a Mario release was surely taken with sales and popularity in mind. 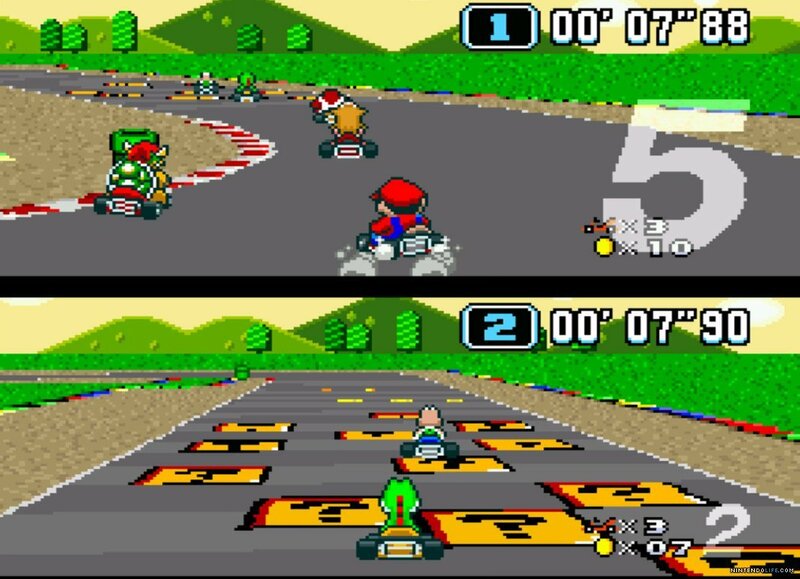 System shortcomings, assessing them now, arguably played a significant part in enabling the Super Mario Kart experience to be so different to that of F-Zero. Accommodating two players necessitated simpler track design in order to process two screens, and that early focus on a desire to prioritise multiplayer surely contributed to the design choice of single player still operating a split-screen, albeit with a map on the bottom. With multiple race classes - that are a darn sight harder than in modern efforts - there was a chance to learn courses and, of course, identify shortcuts. This first Mario Kart title handled very differently to modern efforts, too, with power sliding but not the easy-peasy drifting that's associated with current day entries. Picking up coins to unlock top speed, one-time item panels on the track - this original entry had some design approaches that have largely been left out of home console follow-ups, though coin collecting is back on the agenda in the current generation. For some, though, the relatively simple-but-tricky course designs, combined with challenging handling, makes this not just the original but also the best Mario Kart. That is, of course, up for debate, but what's certain is that this was a major hit in the SNES era. Its visuals - utilising Mode 7 for a 3D feel to the pixel-based characters and tracks - were hugely impressive for the time, while the inclusion of multiplayer and Battle mode - in addition to Grand Prix and Time Trial - were all hugely popular features. Being able to play with a friend in head-to-head play was, in that era and with a game looking this good, a real treat. As for Super Mario Kart's legacy, on a basic level it spawned a total of seven sequels (so far and not counting arcades) which are typically among the best-selling games on their respective systems. Though it may seem minor in this age of Mario Kart 8 and IP-busting DLC, SMK was also a big step in demonstrating the popularity of Mario spin-offs in general. After capturing hearts driving a kart Mario would go on to star in a lot of sports games, a trend that continues to this day along with a whole load of other genres. It's still a popular title in the modern day, too, with the competitive record-setting scene in Time Trials going strong and annual World Championships taking place in France. There are also still plenty of Nintendo gamers of a certain age, we suspect, that fire it up on a regular basis. Super Mario Kart may look and feel a lot different from its successors - with the exception of Mario Kart: Super Circuit on GBA - but it was an important catalyst for one of Nintendo's biggest franchises. It made kart racers cool and fun, too, while showing there was more to Mario than platforming and occasional cameos. ...I'm scared that I'm going to get slaughtered for saying this, but I only played the original Super Mario Kart once, and I didn't really care for it (PLEASE DON'T KILL ME!). Then again, it was only once, so maybe I should just play it again and see if my impression is any different. Anyways, it started a fun little series that, despite the ENORMOUS amount of frustration it has given me over the years, I still come back to. You have to respect the game that started the phenomenon that has evolved into the Mario Kart we play today. I definitely feel that the series has steadily gotten better with each entry but for me 64 will always have the most memories. This was a good game for its time and I personally find it better than Mario Kart 64, but I slightly prefer the GBA version over Super Mario Kart. While Super Mario Kart hasn't exactly aged too well, I think it can still be enjoyable. The controls can feel weird and take a long time to get used to. I mainly used Koopa Troopa (seriously, why wasn't he in 64 or Super Circuit or DS?) and sometimes Toad, since they both seemed to be the easiest to handle. Battle mode is fun and 2 players is fun as well. Overall, it's a great SNES game. My SNES was a bundle that included this and Super Mari World, so I put a crazy number of hours into this game. It was one of those games that I truly felt like I knew inside and out. You had to grow up playing this game to really enjoy the game. The Super Nintendo era was such a great time for gaming, and this era still holds some of the best games ever. I never had access to a SNES, apart from a brief glimpse of Street Fighter 2 when my older brother had a friend over, until I visited a friend's house in 1993. He had Mario Kart and it made a big impression on me at the time, particularly the battle mode. A uniquely fun experience. My wife and I would play this together all the time (way before we were married). We prefer to race co-op through the grand prix in these games. This first one is still so much fun. There are a couple of tracks where she loves to get the mushroom and boost over a jump to get a ridiculous gain. That and the feather was a lot of (dangerous) fun. The best Mario Kart game of all time. I remember gambling with my friends back in middle school and high school playing this game. Great times! It's been forever since I've seen this game. This was my first Mario Kart, and was probably my second Mario game ever. Those screens make me feel like a 4 year old again. Unlike SMW and Mario 3, I've never been able to play this in any capacity after my mom got rid of her SNES. So it's been forever since I've thought about this game. It was also the first racing game I've ever played, and started my love of that genre. If I wasn't played SMW or All Stars, it was this. Heck I still remember Rainbow Road. It felt majestic to my young mind as I saw the colors and heard the music. This is the only 'TRUE' Kart racing in the Mario franchise. It has small, simple, fun courses. The latter ones just have courses taking place everywhere. Not really a Kart racing feel anymore. Also, this game is a delight to mod. I love making custom battle tracks. You would be surprised on what you can achieve in a 128x128 8px tiles grid. Still the best Mario kart! All other since have tried to hard to make the person in 8th be able to catch you. Super Mario kart was the only game that really rewarded skill. @Yellowkoopa Wow, and I thought I was the only one who thought like that. They didnt add koopa troopa because in the manual, wario stole his kart, and SMK CC character sprites is mostly based on M64. Super Mario Kart was a system selling machine for me and my friends. Up to this day I still think it's one of the better Mario Kart games in the series. Until MK8 came along this was my favourite Mario Kart title. The fact that they slowed it down compared to F-Zero (which I love) added to the charm. Imagine my dismay when MK64 came along with its speed jacked up on steroids. It lost all that charm and ended up being quite rubbish. Times have changed and now that speed is necessary. I'm surprised people found SMK difficult though, I found it easy. Perhaps being an F-Zero veteran, at the time, helped. One of the best game ever made. MK64 was such a disappointment to me after this one. It was slow, empty, boring. Good thing the N64 had plenty other good arcade racers. Then Double Dash came and I found again the fun of SMK. It was as intense as the chariot race in Ben-Hur but with Mario. Super Mario Kart is somehow the best Mario Kart game, not because it's the first one but because it requires driving and gaming skills and doesn't rely heavily on luck and powerful items. The gem that started it all! I'm just a big Kart fan overall and there are so many good versions. I played this the most as a kid but I also really like the N64 and Wii versions, too. MK8 is on another level with the graphics, gameplay and online capabilities. It's my favourite entry. So many good memories from this game! I wasted a lot of my childhood on the multiplayer mode. I was so sure this game would be rubbish first time I saw it in a magazine pre-release preview (because it was a spin-off and generally spin-offs generally were poor). I really couldn't believe how good it was when I got to play it. In the end I played the thing to death because it was so much fun. This was a great surprise to play after beating SMW. I loved this game to death, going to school and talking about it with classmates. Fond memories in in SMK. @Gridatttack I always thought that's was a weird reason for Koopa not being in 64, but at least they explained it there I guess, lol. And they probably didn't feel like adding more characters in SC.